... “A large handsome stone building, standing well on rising ground and backed by a ridge of woody hills.” Jane Austen, Pride & Prejudice. And it remains the same to this day: The Rutland Arms, where the author is widely accepted to have revised the manuscript to her most well-known novel in 1811. Indeed, many believe the story to be peppered with thinly-disguised references to the building. 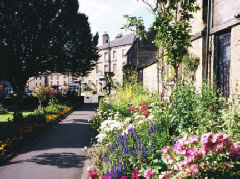 Situated in the ancient town of Bakewell and at the heart of the Peak District National Park, the hotel - built in 1804 - stands on the site of another famous hostelry: The White Horse Inn. However, it is The Rutland Arms itself which can lay claim to being the true home of the Bakewell Pudding. It was here that a chef once mistakenly altered the ingredients of a strawberry tart only for the finished product to surpass the expectations of the guest.